Have You Had Your Cells Checked? This is an obligation-free cell check or Live Blood Analysis. Its purpose is to assess the health of your blood, pinpoint damaged and unhealthy blood cells, find out and discover the causes of these discrepancies. Is it because of your poor and unhealthy lifestyle? Or is there an illness that you can prevent? 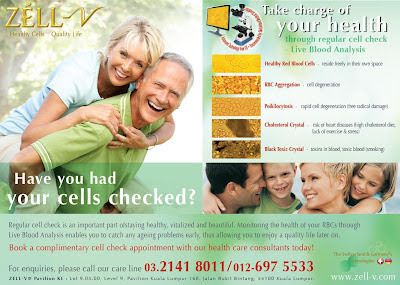 Most importantly - Zell-V cell check can advise what you can do to change all that. It's fast, painless, fuss and hassle-free; and it's non-obligatory too! Reside freely in their own space and their role is to efficiently transport nutrients and oxygen to the entirebody to maintain good health. Rapid Cell Degeneration Causes: Free radical damage and oxidative damage. Immune system injury. Risk Of Heart Diseases Causes: High cholesterol diet, lack of exercise and stress. High blood acidity causes cholesterol to crystalize. Toxins In Blood, Toxic Blood Causes: Tobacco chemicals, heavy drugs, degenerative disease implications. Lot 9.05.00, Level 9, Pavilion Kuala Lumpur, 168, Jalan Bukit Bintang, 55100 Kuala Lumpur. 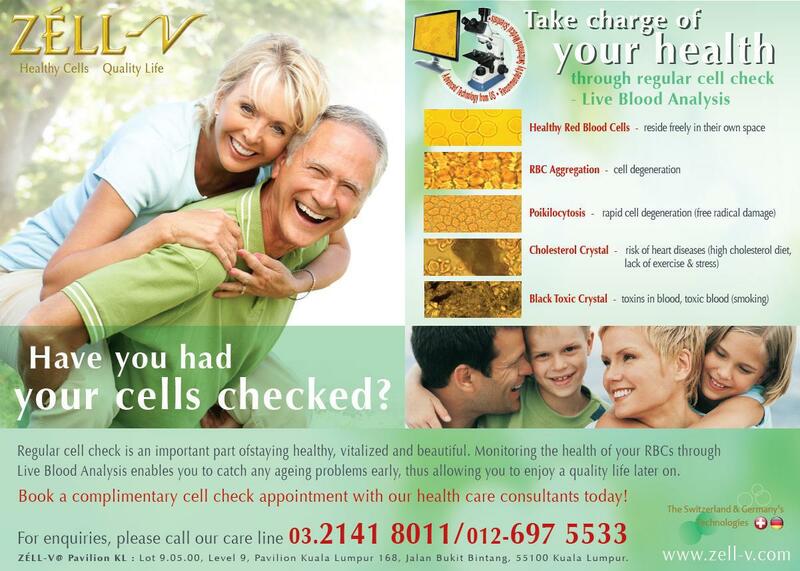 Zell-V specialise in cellular therapy products for rejuvenation and anti ageing under the ZÉLL-V brand name. Established in 1990, Zell-V has today, expanded throughout Malaysia and Singapore. Zell-V is supported by an international medical board of medical practitioners, biologist and wellness professionals. Zell-V's aim is to provide health & wellness to Zell-V's customers professionally. Zell-V is also supported by a number of international medical and wellness institutes and bodies such as The German Society for Thymus Therapy, Germany the International Association for Organ Cell Therapy Specialists, Switzerland & Germany.